November 27, 2017 8:30 A.M.
Ontario is investing in hospitals to improve energy efficiency, reduce greenhouse gases and redirect savings into patient care across the province. John Fraser, Parliamentary Assistant to the Minister of Health and Long-Term Care, was joined by Chris Ballard, Minister of Environment and Climate Change, at the Hospital for Sick Children this morning to announce the Hospital Energy Efficiency Program, which will help hospitals save energy and encourage the use of more renewable energy technologies. The Hospital for Sick Children is receiving funding for 10 energy-efficiency projects. This year, Ontario is funding 180 projects at 98 hospitals across the province, including 117 heating, ventiliation and air conditioning projects, 35 lighting projects and 28 projects that address other energy efficiency needs at hospitals. As a result of these and other improvements, almost five megatons of carbon dioxide equivalent gases are expected to be eliminated from the environment by 2050, the equivalent to taking about 40,000 vehicles off our roads. By 2020-21, it is estimated that over $60 million will be generated in annual energy-related savings. This program is an initiative of the Climate Change Action Plan and uses proceeds from Ontario's carbon market to modernize facilities such as hospitals, universities, and heritage buildings. Improving patient care at hospitals across the province is part of Ontario's plan to create fairness and opportunity during this period of rapid economic change. The plan includes a higher minimum wage and better working conditions, free tuition for hundreds of thousands of students, easier access to affordable child care, and free prescription drugs for everyone under 25 through the biggest expansion of medicare in a generation. Ontario is investing $64 million this year in the Hospital Energy Efficiency Program. The Hospital for Sick Children is receiving $855,000 for 8 energy-efficiency projects (revised November 27, 2017). As part of the 2017 Budget, Ontario is also spending an additional $9 billion for new hospital projects, bringing the total planned investment in hospital infrastructure to more than $20 billion over the next 10 years. Ontario is making the largest investment in hospitals, schools, public transit, roads and bridges in the province's history – more than $190 billion in public infrastructure over 13 years, starting in 2014-15. To learn more about what's happening in your community, go to Ontario.ca/BuildON. The Climate Change Action Plan and carbon market form the backbone of Ontario's strategy to cut greenhouse gas pollution to 15 per cent below 1990 levels by 2020, 37 per cent by 2030 and 80 per cent by 2050. The government will report on the plan's implementation annually and review the plan at least every five years. Ontario’s carbon market proceeds will be invested into projects that help families lower their energy costs and save money. 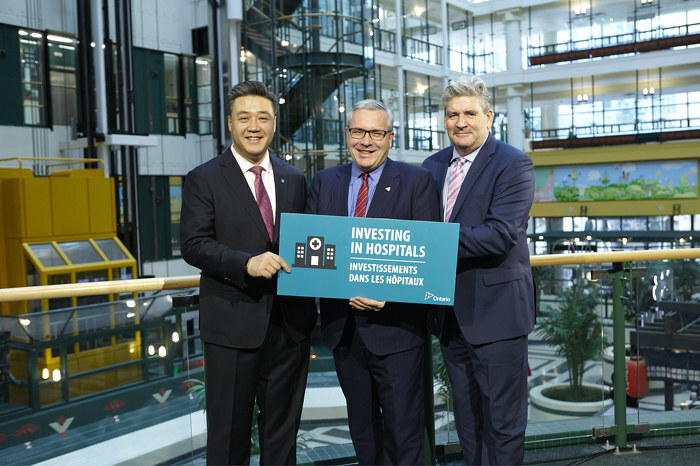 (Left to Right) Han Dong, MPP for Trinity-Spadina, Chris Ballard, Minister of the Environment and Climate Change, and John Fraser, Parliamentary Assistant to the Minister of Health and Long-Term Care at the HEEP event.